Republican Gov. Larry Hogan set forth priorities on fiscal responsibility, pro-business governance and tax cuts Wednesday in his annual State of the State speech to the Democratic-led legislature. “[My agenda] will improve the lives of those who need it most: working families, retirees and small-business owners,” Hogan said. Hogan cited a boost in education funding as one of his biggest successes during his first year in office. “We increased spending to historic, record-high levels, adding a total increased investment of $830 million dollars more in K through 12 education,” he said. Hogan also highlighted the struggles of the past year in his speech, including riots in Baltimore and his fight against cancer. "This past year has been one of many milestones. For me, none more extraordinary than when I had the honor of being blessed by Pope Francis on behalf of cancer patients around the world,” he said, before he received a standing ovation from Democrats and Republicans alike. Hogan maintained a bipartisan tone and called for cooperation between his party and the Democratic majority in the state Senate. "There is so much we can find agreement on," he said. Transportation was front and center during the speech, and Hogan highlighted major infrastructure expenditures. “We are investing an unprecedented $2 billion into shovel-ready infrastructure projects to fix every single structurally deficient bridge in the state,” he said. State Sen. Cheryl Kagan told NBC4 that Montgomery County is ready to proceed with a new interchange that will help the area with traffic problems. Construction was delayed in January. “The Watkins Mill interchange is ready to go, and we hope we’re going to get it funded and start breaking ground so we can move forward,” Kagan said. 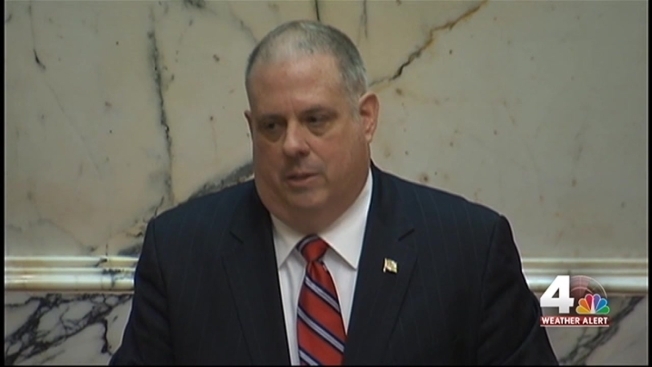 Republicans praised Hogan’s accomplishments in his first year. "Better control of the way our governs functions. Not just increased money for education, but making sure that money works,” said Nic Kipke, Republican minority leader in the state Senate, “He's accomplished a lot over the last year and I'm very excited about where we're going in the future." The state Senate Democratic leader, Thomas V. Mike Miller, Jr., said he felt some issues were not addressed in the speech. "The issues that weren't addressed include transportation in Montgomery County. A hospital in Prince George's County. The problems and needs of Baltimore city,” Miller said. Also, Montgomery and Prince George’s County leaders said Hogan held back millions from their schools. "That, for us, is $20 million in education funding that the governor left out of last year’s budget -- and he has a $300 million budget surplus. That money is definitely needed for us in Prince George's County. Same thing with Montgomery County,” Prince George’s County Executive Rushern Baker said. Those districts both rank in the top 10 Maryland counties that spend the most per student, The Baltimore Sun reported. Looking forward, Hogan is pushing for modest tax relief this year, adding up to about $480 million over five years. He also is proposing legislation to fight heroin addiction and to reform how congressional and state legislative districts are drawn.